As dairy prices remain low, many dairy producers are looking to make more from grass. The past year has been an extremely difficult one for dairy farmers, with milk prices plumbing nine-year lows following one of the longest downturns in memory. But British dairy farmers have really risen to the challenge, cutting costs to the bone and finding new efficiencies where many thought there were none. What has been particularly interesting is how producers are making more milk from their grassland, cutting out more expensive feeds and focusing on profitability rather than turnover. Kingshay figures show the average herd produced 33% of milk from all forage in the rolling year to September 2016, against 30% the previous year. 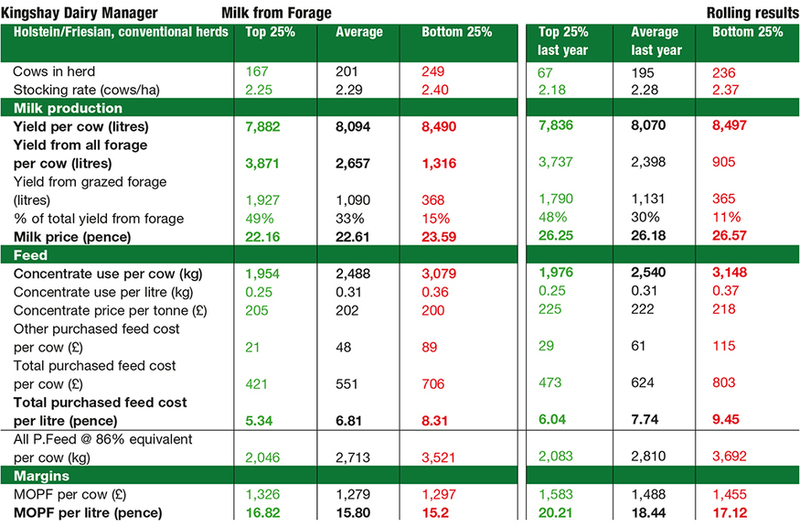 And the biggest improvement has been made by the bottom quartile of producers, when ranked by milk from forage. Kathryn Rowland, senior farm services manager at Kingshay, says: “The bottom quartile improved their forage use in 2016, producing 1,316 litres per cow from forage – or 15% of their milk, compared to just 905 litres in 2015 (11% of their milk). The top quartile also made an improvement, but by a much smaller margin of one percentage point.” Even so, there is clearly scope for the bottom quartile to do more, as the top 25% of farmers produced 49% – or 3,871 litres – of their milk from forage. The biggest change among the bottom quartile was greater use of conserved forages, as yields from grazed forage only increased from 365 litres to 368 litres, compared to 1,927 litres in the top 25%. “We can also see many farmers have reassessed their rations, cutting out expensive supplements and minerals,” says Mrs Rowland. The bottom quartile cut ‘other purchased feed’ costs from £115 per cow to £89, although there is potential to go further given the top quartile only spent £21 in that area. Overall concentrate use remained relatively unchanged among the top 25% of producers, at 1,954kg per cow, with the bottom quartile trimming usage by 69kg to 3,079kg. “Savings in purchased feed costs between the top and bottom 25% equate to £35,674 for a 150-cow herd yielding 8,000 litres per cow,” she explains. But interestingly, the top quartile spent more per tonne on feed, indicating a choice of higher quality concentrates. Kingshay can accept no responsibility for the information supplied to it. Every care will be taken by Kingshay to produce an accurate report but it does not accept any liability for any loss (whether direct or consequential) arising from any defect in the report. It is also worth noting the top quartile actually received less for their milk, at 22.16ppl against 23.59ppl in the bottom quartile. With all of this cost-cutting going on, there was a risk it would impact on milk yields and cow health – but yields have remained relatively unchanged on the year, at 7,882 litres for the top echelon and 8,490 litres for the bottom sector. Grazed grass remains the cheapest feed available for dairy cows, with one megajoule of energy costing half the price of silage and just a third of purchased concentrates, says independent grassland consultant Dr George Fisher. “The crux of profitable dairy farming is getting more milk from the lowest cost feeds.” He has calculated that producing a litre of milk from grazed grass at current prices costs 3.1p, compared to 6.6p from grass silage, 5.6p from feed barley and 9.6p from high energy concentrates. Although tight milk prices have encouraged a lot of farmers to make more from grass over the past year, it is vital they do not allow inefficiencies to creep back in as milk prices improve, he warns. That said, it is possible to minimise volatility by choosing appropriate grass seed mixes, applying the correct amount and type of fertiliser, and paying attention to grazing and silage management. By getting all of the detail right, farmers can significantly boost both yields and forage quality throughout the year. 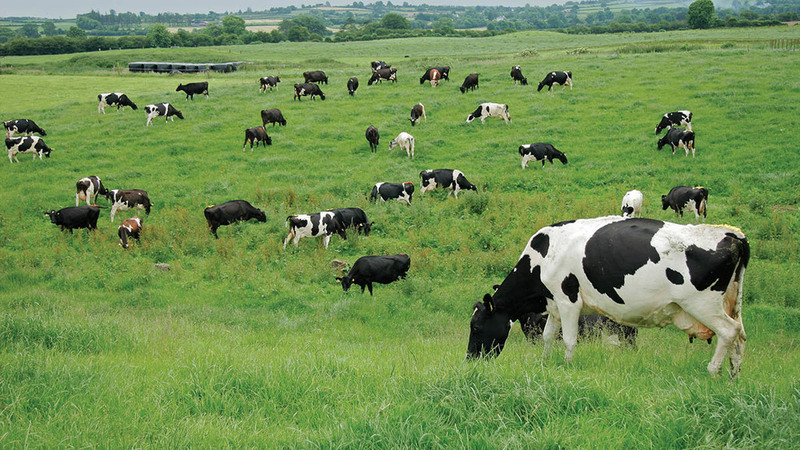 Later on in this guide we explore every step of the grass management process, from variety selection to ensiling, with a focus on some new research and technology which can really improve both grass quality and milk yields. But is there much point in doing that if you are not currently making the most of what you are producing? According to Dr Fisher, even the very best farmers are only utilising 70% of their grass silage, and most will be wasting a lot more than that. For example, from a 12t DM/ ha standing crop, 5-10% will be lost at cutting, a further 10-25% during the ensiling process, 3-10% in spoilage, and 5-15% in passage refusals.